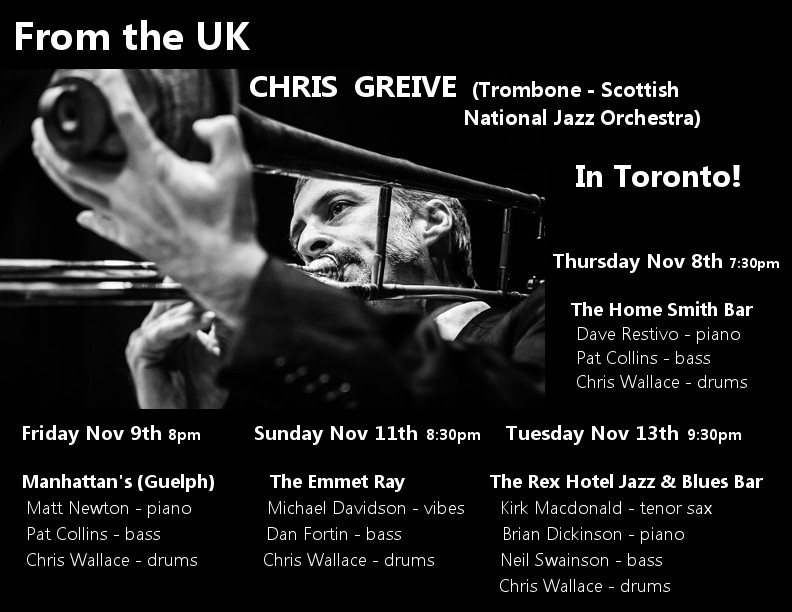 Chris Greive is one of Britain’s best jazz trombonists and has been lead trombone in the Scottish National Jazz Orchestra for over 20 years. Born in Perth, Western Australia in 1969, Chris started his musical life on Trombone and gained his BMus degree through WAAPA’s jazz program. Chris recorded & performed with many acts on the Perth Jazz scene, including wife Becc Sanderson, The Michael Pigneguy Sextet (to name only a few) & was a finalist in the Australian Jazz Brass Awards (1996) before relocating to Scotland in 2000. Chris has toured with the likes of The Bad Plus & Salsa Celtica and his own highly acclaimed group ‘Newt’ (‘Ensemble of the Year’ 2012 Scottish Jazz Awards). NeWt were chosen to represent Scotland at the Made in the UK showcase 2012 at Rochester Jazz Festival as well as playing dates at Toronto Jazz Festival & Vancouver Jazz Festivals. A new album NeWt North will available autumn 2013 featuring music devised on, and influenced by the local environment & stories from, Unst, Shetland. He currently teaches Jazz Arranging, History & Improvisation at the Royal Conservatoire of Scotland (Glasgow), plays Lead Trombone, and sometimes arranges for, the SNJO with whom he recently toured the USA, recording with such artists as Randy Brecker, Mike Stern & Kurt Elling among others.